A Hopi doll with painted headdress springs to life, spinning under my finger tips on a new iPad app from the University of Virginia Art Museum (UVaM). The delightful app presents 19 different objects in 3D, to spin and zoom, providing an immediacy that rivals seeing an object in real life. In fact, it’s better in many ways than peering at an object through a protective case because the objects can be spun through a full 360°, view under bright lighting, at high resolution. What are QR Codes? And how are they useful for outreach? 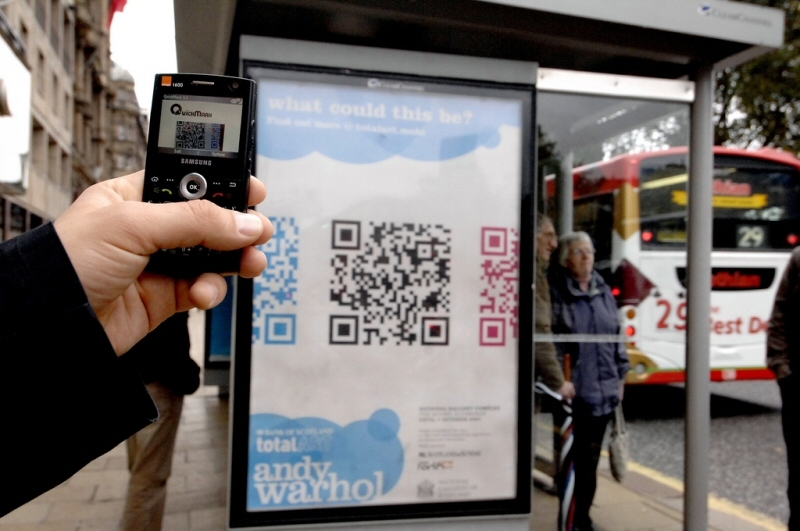 QR codes are a way to send information to mobile devices (e.g., a smartphone) using its camera. You send a short blurb of text, or a web address (URL) by representing it as a code which people photograph from their phone. The codes are easy to generate. Several web sites and software programs will make the codes for you. To read the codes, users need a QR reader app to take a snapshot of the code with their device’s camera. The app returns the decoded text or web URL. In the photo at left, a pedestrian takes a photo of a QR code promoting an Andy Warhol show.